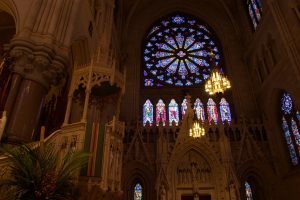 “Did Jesus Christ deliberately found a visibly organized church?” Jesus Christ certainly founded a visibly organized church, the Catholic Church. Christ shows his care in the future of his mystical body, the Church, by choosing the men who would be faithful followers and do His will. Jesus chose Peter, the Rock, to be the solid foundation and the head of the Church on earth so that the faith would not quaver under evil. Our Lord even referred to his Church with words such as sheepfold, and city. He also laid out a set of rules for His followers to abide by to maintain the great order of his Church. This Document will prove to its reader from Biblical references, that the Church is truly founded by God as the true religion. When Christ chose his followers, He gave them the powers and graces needed to be the light of the world, as seen in (Mt 18:18), when Our Lord said: “Amen, I say to you, whatsoever you shall bind upon earth shall be bound also in heaven: and whatsoever you loose on earth shall be loosed also in heaven.” The passage from Matthew is Jesus giving the power of reconciliation to His closest choice followers, the Apostles. He gave this supernatural power to them so they might keep his Church holy and faithful to Him and stay in the light of his grace. In the final chapter of Matthew (28, 18-19), Our Lord said to his Apostles: “…All power is given to me in heaven and in earth. Going therefore, teach ye all nations: baptizing them in the name of the Father and of the Son, and of the Holy Ghost.” This is when Jesus gave the Apostles their mission: to spread the truth to the world, and bring those who are astray to the Catholic Church which Jesus Himself founded. After giving His followers their mission, Jesus appointed a head of His Church. Peter, a humble fisherman was Our Lords choice to lead the world back to the truth, the Catholic Church. In Matthew 16: 18-19, Jesus said, “And I say to thee that: thou art Peter; and upon this rock I will build My Church: and the gates of Hell shall not prevail against it. And I will give to thee the keys of the kingdom of heaven…” This is the appointment of the first Pope, who Christ appointed to lead the church, and protect it from heresy. The only way for a religion to exist is for all of the member to have a head, Jesus Christ chose Peter as the head of the early church so that order, and guidance may be seen in His foundation. Christ speaks organization in many aspects of the Church which is why it still stands tall and straight today. Jesus said the words Sheepfold, Kingdom, and City many times, and the Apostles followed this idea of unity throughout their travels. With this organization, Christ gave three very important rules by which all Catholic men, women, and children should follow. Firstly, believe in the truth. What does this mean? In the Bible (John 17:3) the scripture passage explains: “Now this is eternal life: That they may know thee, the only true God, and Jesus Christ, whom thou hast sent.” All Catholics, to be a Catholic, must believe in the truth, which from this reading is God. Secondly, do the will of the Father. This is laid out in the book of John (14:23) clearly. “Jesus answered and said to him: If any one love me, he will keep my word. And my Father will love him; and we will come to Him and will make our abode with Him.” This explains what happens if Our Lord’s word is kept. God will give those who followed Jesus’ rules an abode with Him in Heaven. Who could refuse such an offer? A life of good and obedience to God will give a reward such as Jesus promised, Heaven. Lastly, the final step of being a member of Christ’s church is: receive and grow in the supernatural gift of sharing in God’s divine life. Once again, the book of John (6:54) gives the answer. “Then Jesus said to them: Amen, amen, I say unto you; except you eat the flesh of the Son of man and drink his blood, you shall not have life in you.” This scripture says that we will have nothing to do with Our Lord if we do not live in him by receiving the sacraments, and staying in His grace. This orderly religion, the Catholic Church, has been referred to by Our Lord as sheepfold, and kingdom, and Jesus also bestowed upon man, the rules of how to be a member of His Church. 9/11, The Academy Will Never Forget!